Maintain overweight: Despite rubber products being one of the best performing sectors in Malaysia for 2018, share prices have corrected -11.5% since the start of the year and underperforming the FBM KLCI’s return of +0.2%, due to renewed concerns over a potential supply overcapacity and a recent strengthening of the ringgit. While we maintained our “overweight” call on the sector, there could be a downside risk to our thesis, depending on the outcomes of China’s environmental policy. As economic activities slowed in China due to the ongoing trade tensions, the government has set a less ambitious environment goal target for 2019. Manufacturers have been given a longer grace period to convert their coal-based burners to more environmentally friendly gas-based burners. The change has helped in easing a shortage of vinyl gloves and reduced the overall selling prices for vinyl gloves. Nevertheless, as we still believe Beijing remains keen on improving the country’s air quality, the conversion will resume in our view. We still expect vinyl gloves’ prices to rise, expediting the switch from vinyl gloves to latex or nitrile gloves. The negative impact may be reduced as medical gloves exported from China to the US are currently exempted from an additional tariff, and if the trade tensions escalate and a 25% tariff is imposed on all items imported from China, manufacturers from other countries such as those in Malaysia are potential beneficiaries. China’s export market share for medical gloves to the US is about 30%, and 70% of those gloves are vinyl-based. The US is the world’s largest medical glove consumer, taking up 30% to 35% of global production. We are not too worried about a strengthening ringgit against the greenback, as we have assumed an exchange rate of RM3.9 against the US dollar by end-2019. Moreover, we believe manufacturers are able to pass a rising production cost to customers, within a reasonable two to four weeks. However, a spike in volatility of the ringgit recently may put pressure on margins, as manufacturers may not be able to revise their pricing significantly in a short period. Nevertheless, we believe the problem is short term in nature. We expect Malaysian manufacturers to raise their capacity at about 15% to 18% for 2019. 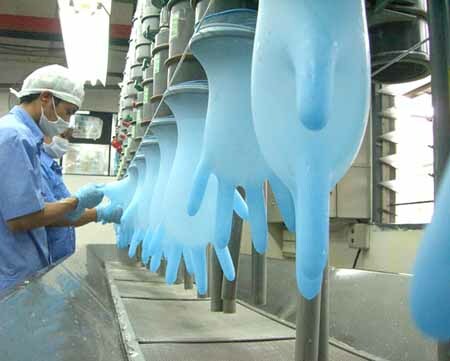 While the capacity growth may outpace demand growth of 8% to 10%, we do not think this will create an overcapacity issue as older production lines will be phased out to cater for speciality gloves. Manufacturers are also venturing into the non-medical sector, providing an additional avenue for growth. Kossan Rubber Industries Bhd (buy; target price [TP]: RM5.15) and Supermax Corp Bhd (buy; TP: RM2.30) are top buy ideas for Malaysia and our preferred picks for the sector.